The irony of visiting the set of a big-budget, effects-driven science fiction film is that as much spectacle and scale as there is on the screen, there's often much less on set. Such was the case on the New Orleans soundstage where Green Lantern was being shot: according to cast and crew alike, much of the work involved acting and reacting inside a "blue box" which would later be replaced by great interstellar vistas and creatures that, well, quite frankly you might not want to see in person. 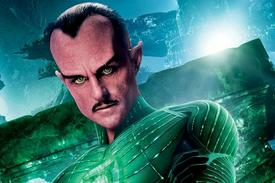 For actor Mark Strong, even his physicality wasn't all there; in addition to platform boots that gave him an extra five inches of height, he strapped on a motion-capture suit and provided what will eventually be the physicality of Sinestro, a member of the Green Lantern Core who's none too pleased to discover that Hal Jordan, played by the decidedly earthbound Ryan Reynolds, has replaced his late mentor as the latest addition to the Lanterns' group of galactic policemen. Although we didn't see Strong in action, Boxoffice sat down with him for an interview about creating Sinestro, where he talked about coming to terms with the character's physical, emotional and even historical dimensions. When you are playing a character like this whose story has a lot of developments yet to come, how much are you thinking about his future, and how much are you focusing on what's happening now? A little of both. Because I thought initially the way to deal with it would be just to play what's in the script and ignore what's ahead, but the fact is I'm so aware of what happens to this character over the course of the comics. I've had a number of really interesting conversations with Geoff Johns about back story that doesn't even exist in the comics that he kind of knows about, which I find really interesting to fill in elements of the character. But the truth is knowing what happens to Sinestro kind of defines the way he behaves in this film, [because] in this first one he is essentially a hard taskmaster for Hal. He's his mentor as he comes into the Core, and he obviously doesn't believe human beings should be members of the Core so he's pretty antagonistic towards Hal. But that isn't to do with what happens to him subsequently in the later story, it's to do what he believes humans are capable of, so there is a streak of arrogance and danger about him. I see him in this more as kind of a military commander than anything else and that's how he needs to be to control the core; and they are facing a very dangerous enemy, so he is in protection mode. But he is not evil in this first one in the way we understand he becomes. Was the look of your character all finalized when you came on board? No. I was shown some designs and I enjoyed the fact that I became a part of the process because I had very strong feelings about how I think he should look and how I wanted him to look. And they weren't exactly as they kind of initially should have been, in my opinion, in the drawings, in the production design. I understand why they were designed they way they were; they wanted to kind of portray Sinestro as a warrior. And the look they had was of a very different kind of warrior to the way that he's depicted in the comics. I think it's already common knowledge there was a ponytail involved with a kind of a very strong piece of metal jewelry at the back of his head, and he had a goatee and he looked very different. And I made a big play for keeping him looking as much as he does in the comics, and I just thought that was a fantastic look. And as I'm sure you all know, he's based on David Niven, bizarrely, who had a trademark moustache and widow's peak, so I argued strongly for keeping him like he is in the comics, and what was wonderful about the process of the make-ups we went through was we found our way there. And I think everybody now agrees it's a very strong look. Speaking of the physicality of Sinestro, can you tell us a little bit about what the action sequences were like? Well, I came in a couple of weeks early because I wanted to get to know the fight, and I wanted to do some wire work because obviously I fly. That was really fascinating; in the old days when [characters flew] and they look like they haven't quite landed properly even though you're supposed to believe they've flown all of their lives, that's different now because the computers control the wires. So you know exactly your take off point and your landing point, which helps enormously. You can very casually fly in and land and walk because you know exactly the point that it's going to hit the floor, you haven't got somebody pulling the rope. So that was a revelation. And then you have this six wire arrangement where you a harness that has three clips up and down your body and they can use it to take you up, make you horizontal, maybe upside down, bank you from side to side, put you on a diagonal so you can fly. They just fly you up there and you have to just to get on with working on how you fly and what direction you're going to fly. So I came in and did the fight because there is a sequence that I describe on the training platform where Sinestro puts Hal through his paces, and I think originally that was always going to be constructed fight [where] Sinestro stood back and the whole thing would happen as a construct, but I think we thought it would be more interesting if he got physically involved. And it's interesting that the choices Hal calls up to fight Sinestro with, because they're very earth bound, very human, and very paltry in comparison to what power this ring has given him because he is a new Lantern he doesn't quite understand what he can do with it. So we had a physical fight, which required us to learn the moves. That was difficult in this heat and in those suits, and also Sinestro, I don't know think I've said this to anybody, he's 6'7" as opposed to 6'2", so I wear these disco boots which are big foam, pad boots which I had to do the fighting and that was interesting. I mean in fact if you saw the way I looked on set and I truly hope no photograph of me on set makes it out into the world because I've got these ridiculously high boots on. This very, very tight kind of lycra grey suit with dots all over it, and it's a weird look, and I'm looking forward very much to seeing what kind of physicality I get, what kind of body. How do you sell standing there and putting energy in a room like that? Well you have to decide how your character is going to use their ring. What's very interesting is the way they are grading how each of the Lanterns look. I mean each suit is going to suit the particular kind of alien they are, so they all are going to be different. By the same token you have to work out how you are going to use your ring. Hal, I think, has decided to do what any Earthbound human being would if they were given a ring and told point it at something it'll work, he points at something and it works. Sinestro hardly needs to; he's very much in tune with his ring and able to use it. So you kind of have to decide how your character is going to fly, and in the comics Sinestro often flies with his arms folded, but he's also drawn flying with his arms straight out or his arms back, so I've tried to include a little bit of everything, but it all comes from the source material. And you see Sinestro fighting, and sometimes he uses his ring, so actually there is a moment I create a construct where I do it very physically to prove a point. But to answer your question, you decide in the moment how your character will use their ring. Sinestro has what has been described to us as a Henry V moment like when he's talking to the Core, and yet he's got a tragic future ahead of him. Are you infusing any Shakespearean influences into your portrayal of Sinestro? No, but the Shakespeare analogy is very useful because I think the tragedy of his character is epic in the way Shakespeare's characters often are. And interestingly, in terms of playing it, you know I've been in the Royal Shakespeare Company, I've done time on stage there, and I would say that is proving very useful in terms of this because the things that you learn are about reaching a stage filled with two thousand people. You have to make sure the people in the back can hear you, can see what you are doing, and yet you have to be intimate enough so that you don't blast the people in the front, just in practical terms. So on set I feel like the voice and his movement are probably the most similar to what I learned doing Shakespeare, and playing Shakespeare on stage, and practically that just means there is a stillness about him, a strength about him, and gestures become very—if you're in a huge two thousand [person] theater you if you want to make a gesture, you can't do naturalistic stuff like you would if you were talking like this, because it doesn't look strong. You literally have to use your arms in a certain way, you have to play stuff in a certain way to give your character strength, because he is an alien as well, and I have to give him something stronger than an ordinary human being. So the Shakespearean analogies are not that far wrong. Are you taking most of your cues from the script or do you have to connect some either experience you had or some other structure to give you some sort of personal connection to it? Do you ever borrow or incorporate any sort of common elements from any of the villains you've played in the past? You have to be very careful, because I'm still Mark Strong in the end of it all, whoever I am playing, and you could only perhaps demonstrate anger in a certain number of ways. I mean, naturally we'd all demonstrate anger in different ways, but there would probably be a common DNA to all of our anger, so I feel like the danger of all the characters or the menace of all the characters I've played, they certainly share a DNA. I think if I tried to change that just because I played it before in a different character, I would not be being true to the character I'm playing. I would be adjusting it because of the past performance, but the truth is past performances are now irrelevant. I am here and now with Sinestro and he has whatever feelings and has to deal with whatever environments he's in, in the way he does it. If I start thinking "oh I've done that before, so I can't do this" or "I did that before, so I'm going to do that in a different way," or "I'm going to make that the same of something that I've done in the past because that was successful;" that's a wrong road to go down, and I don't do that now.